All of us have heard of The Christmas Carol, but very few of us may have heard the true story behind the author. What motivated Charles Dickens to write about Scrooge and Tiny Tim, how did his story impact his own life? 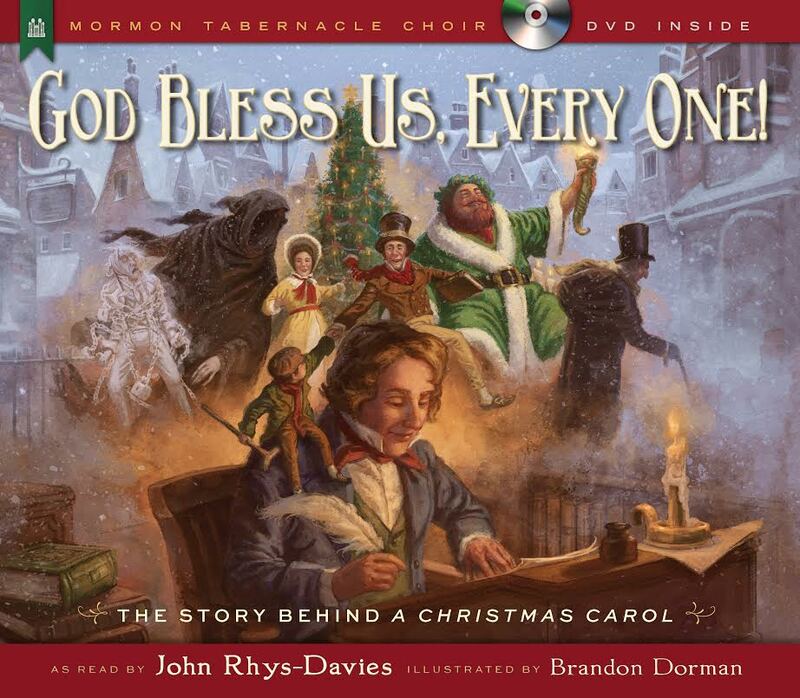 With beautiful illustrations, God Bless Us, Every One is the picture book script of the Mormon Tabernacle Christmas program brought to life, read and written by John Rhys- Davies. It is the tale of a well-known writer who found himself in dire straits financially one year and wandered the streets of London depressed of spirit. He saw the penniless, the orphans, who became his characters. And, assisted by a ghost, he sees things from a whole new perspective. We watched the enclosed DVD as a companion to the book and my children loved the flying! This is one way to get your family ready for the season of giving in a multi- media way. Reading, seeing, experiencing Brandon Dorman’s wonderful pictures. We truly enjoyed having the choir and book come to life. John Rhys-Davies is one of modern cinema’s most recognizable character actors, best known for his role as the ax-wielding dwarf Gimli in the Lord of the Rings trilogy. He has gained widespread fame on British television and received an Emmy Award nomination for his work in the television miniseries Shogun. Brandon Dorman is the illustrator of the New York Times bestseller The Wizard. His work has appeared in children’s books and on numerous covers, including the Fablehaven series and The Candy Shop War.